Oklahoma-born Woodrow Wilson Guthrie, champion of the underclass and the union movement, was a genuine poet, though he was never comfortable with that label. He wrote simple, hummable songs that celebrated this nation, but as the Great Depression consumed the country and exposed economic inequities, his tunes took on a tone of angry protest and confrontation. That journey to his political awakening is well captured in Woody Guthrie’s American Song, an occasional biographical revue chock full of his folk tunes, familiar and not. The show, originally conceived and adapted by Peter Glazer, has been kicking around since 1988 and was first produced locally by Florida Stage six years later. Whether or not Palm Beach Dramaworks decided to revive it now because of its resonances to our current political scene, musical numbers on predatory bankers, labor disputes and particularly “Deportee (Plane Wreck at Los Gatos)” about the plight of immigrants seem to speak directly and pointedly to the Trump era. But the summer show at Dramaworks is even appealing if you somehow manage to be entirely apolitical, because of the extraordinary musicianship and vocal skills of the five-member cast and three-member backup band. Each of them is accomplished on a variety of instruments, from guitars to banjos, mandolins to fiddles, and the occasional harmonica and bass. During a second act showy display, they line up and reach over to pluck and strum each others’ instrument in a daisy chain of versatility. Tying the musical numbers together is a sketchy narrative of Guthrie’s life, from his roots in Oklahoma to his migration westward in search of the illusory promise of prosperity in California, then back across the country to his final years as a troubadour in New York. The men in the cast share the Guthrie mantle, telling his history in first person. Jeff Raab talks about Guthrie in his formative years, then gives way to Sean Powell, who takes us on Guthrie’s boxcar journey beyond the Dust Bowl, but not escaping poverty. The third narrator is Don Noble as Guthrie in his latter years, up to his death from Huntington’s disease at 55. 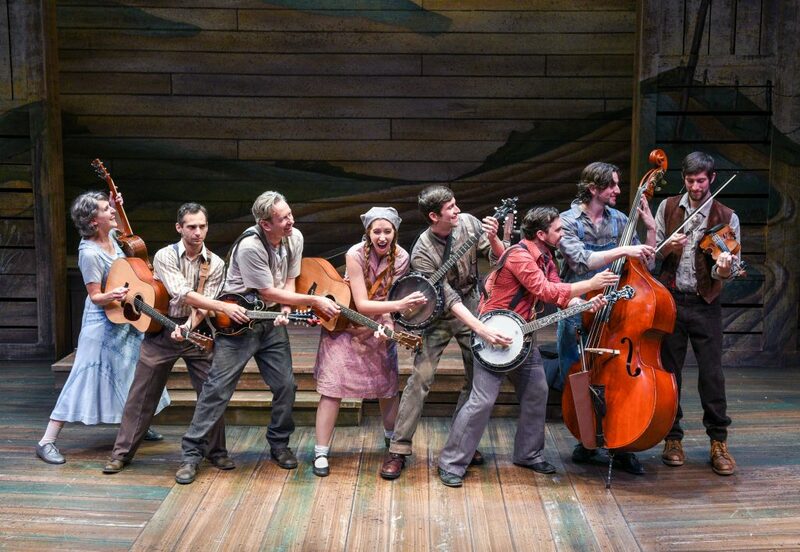 If the women do not exactly become Guthrie, they are integral to the fabric of the show, and Cat Greenfield and Julie Rowe harmonize soulfully on such songs as “Worried Man” and “Ludlow Massacre.” But the discovery of this production may be The Lubben Brothers – Joshua, Michael and Tom – local triplets who comprise the band with astonishing, though low-key, virtuosity. They try to stay in the background, but it is hard to take your eyes off of them. Here’s hoping that Dramaworks finds other ways to showcase the three of them in the future. Directing the production is Bruce Linser, who molds the ensemble into evocative stage pictures – a moving freight train, a migrant camp, a Bowery bar – that help the narrative arc. Scenic designer Michael Amico places it all inside a rustic barn-like structure, with WPA-like murals painted on its wooden planks. Performers change personas with the slightest change of costume pieces by the resourceful Brian O’Keefe and the song lyrics arrive with a welcome clarity thanks to Brad Pawlak’s soundscape. The second act largely gives up on the Guthrie biography, settling instead for a jam session in that Bowery bar. But when the songs themselves have so much drama, little theatrical construct is needed. And when the audience is cajoled into singing and clapping along, we do so willingly, further proof that Guthrie’s musical output from a bygone era still live with vitality today. 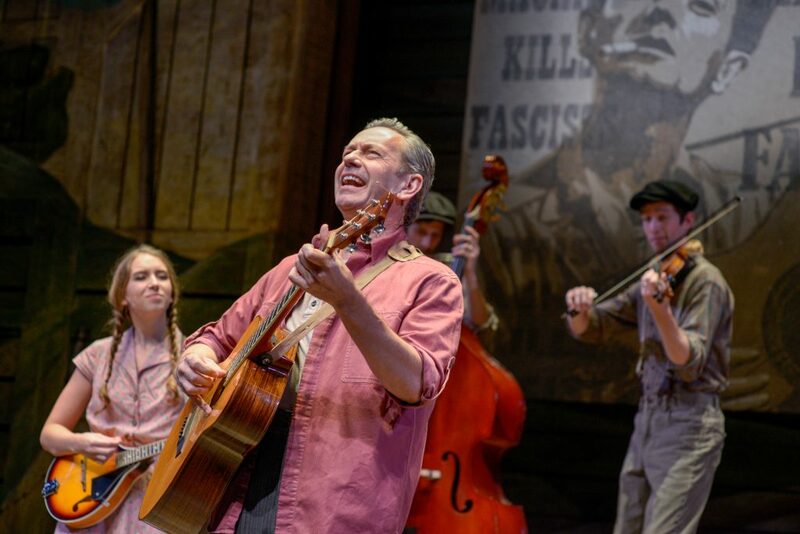 WOODY GUTHRIE’S AMERICAN SONG, Palm Beach Dramaworks, 201 Clematis St., West Palm Beach. Through Sun., Aug. 5. $75. 561-514-4042 or visit www.palmbeachdramaworks.org.